Habit: Perennial herb, shrub, glabrous to hairy. Stem: erect, arching, or pendent, often much-branched. Leaf: opposite or whorled in 3s, entire; veins pinnate. Inflorescence: raceme. Flower: calyx lobes 5, entire, +- equal; corolla generally red, tube with sac-like extension at base, lower lip base +- swollen, generally not fully closing mouth, not spurred; stamens 4, often exserted, staminode 0; stigma exserted. Fruit: ovoid to spheric; chambers dehiscent by 1--2 pores near tip. Seed: many; ridges thin, netted. Species In Genus: 2 species: California, northwestern Mexico. Etymology: (William Gambel, American naturalist, collector, 1823--1849) Note: South American species remain in Galvezia. Habit: Plant spreading, < 1 m, < 2 m wide. Stem: arching, often +- pendent. Leaf: whorled (opposite on seedlings), +- thick. Inflorescence: pedicel 1--2 cm. Flower: calyx 7--10 mm; corolla 2--2.5 cm, bright red. Fruit: 6--7 mm, ovoid, asymmetric; lower chamber larger. Chromosomes: n=15. Citation for this treatment: Margriet Wetherwax 2012, Gambelia speciosa, in Jepson Flora Project (eds.) 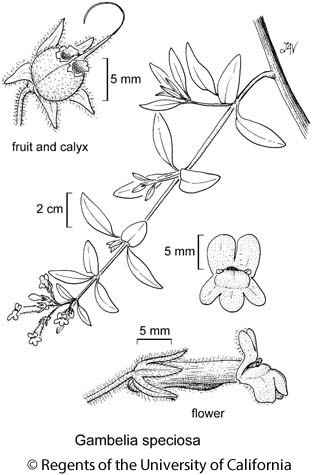 Jepson eFlora, http://ucjeps.berkeley.edu/eflora/eflora_display.php?tid=26444, accessed on April 19, 2019.
s ChI; Markers link to CCH specimen records. Yellow markers indicate records that may provide evidence for eFlora range revision or may have georeferencing or identification issues. Purple markers indicate specimens collected from a garden, greenhouse, or other non-wild location.